Evelyn Ankers was born August 17, 1918 in Valparaiso, Chile to English parents. When her parents relocated to England in the 1920's began to think of acting. While still in England, Eveyln would appear in small roles in the mid 1930s while she was still in school. Eveyln was cast in 'Fire Over England' (1937) with Laurence Olivier and Vivien Leigh and in 'Bells of St. Mary's' (1937). She was found to be not only beautiful but talented, she would soon star in low budget film roles such as 'The Villiers Diamond' (1938) and 'The Claydon Treasure Mystery' (1938). 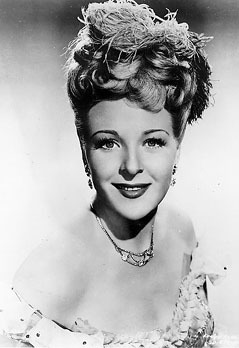 With the War in Europe, Evelyn came to The United States and was immiadiatly signed to a contract with Universal in 1940. Evelyn would find fame in the 1940's at Universal as their reigning Scream Queen (She was called "Queen of the Screamers" on account of her blood-curdling vocal outbursts her films of the 40's). Evelyn often played roles or variations of roles of the cultured leading lady. 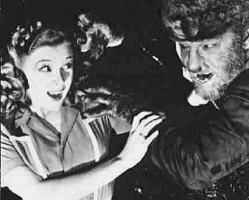 Her first Universal film was with Abbott and Costello in 'Hold That Ghost' (1941) and then in 'The Wolf Man' (1941) with Lon Chaney Jr. , she was only 23 years old. She would also appear with Chaney in 'The Ghost of Frankenstein' (1942) and 'The Frozen Ghost' (1945). Evelyn would marry Richard Denning in 1942 and she would work while he was in the war. She was in 'Captive Wild Woman' (1943), 'Son of Dracula' (1943), 'The Mad Ghoul' (1943). In 1944 she would be in 'Jungle Woman' (1944), 'Weird Woman' (1944), and she would appear with Jon Hall in 'The Invisible Man's Revenge' (1944). She also appeared with Basil Rathbone (as Sherlock Holmes) in 'The Voice of Terror' (1942) and 'The Pearl of Death' (1944). She would be in a few of these movies until 1950. Evelyn's career began to slow when the Monster films slowed. Evelyn would leave Universal in 1945 to do freelance acting at other studios. She would do mostly Mystery and Dramas at Repulic, Columbia, PRC and 20th Century Fox. Evelyn retired from acting in 1950 be a housewife and mother. Occasionally she would still do a role on Television and in 1960 she would return one last time to play in the film 'No Greater Love' with her husband. Evelyn and Richard would move to Hawaii in the 60's stay there until her death. Evelyn Ankers died on August 29, 1985 in Maui, Hawaii. She died of ovarian cancer just twelve days after her 67th Birthday. A low-budget Universal adventure . With Keye Luke, Turhan Bey, and C. Montague Shaw. Evelyn Ankers gets carried around so much that she should have come with a handle. Ankers was loaned out to MGM for this drama. Ankers with frequent co-star Lon Chaney Jr.